Just small intro. I have played PR a bit more than 10 years and saw a lot of stuff and had a fun. Before PR I played BF and it was also fun. I know that a lot of us have almost same values, and some of you maybe share my vision. All good things must come to an end. Again and again I feel that time of PR in current state is not going to be long. Yes, I know, I know that this is 100500's post regardind 'dying PR', but in loving memory of Project Reality I just need to write this feedback. Some memories just need to be written, but in this text I just analysing and writing my thought for few things in game. From my perspective these things making the game itself, like some sort of building - four columns and the base. Current number of players in PR which plays more or less regular is around 350 from my statistics. I don't have the exact stats for previous years, but almost sure that it was higher. The stats shows that we are shrinking and new players not choose PR as their game. There are a lot of reasons of that, but I don't want to make analysis of them. In any way currently we are some sort of closed-community with all the consequences. The mod does not simulate reality, it tries to simulate teamwork by adding difficulties to common tasks. This is opposite to mainstream to simplify tasks and make world to be on-top-of-your-fingers. This saves us from bunch of cheaters and hacks, but add problems with new players and lack of freshnes. The influence of Community to the PR should not be underestimated. For example, the well known asset rule that squad should be named for taking asset so widely used, that there is no more than 4 tanks per map (as for time that I writing this) - because max players per squad is 8 and there is minimum tank crew is two. The Project Reality start from adding some enhancements to vanilla BF2 to stop allowing jump-lie-shoot, adjusting damage, removing hud/hit indicator, adding some vehicles etc etc. Firstly it was called PRMM. Actually at start it was very nice mod and some time after he got an well-deserved award. There are two points of view for "reality" in PR. From one perspective we see flying and jumping vehicles, legs from walls, tanks impossible to drive through little bush, etc. This poing of view is completely not supported, because everyone agree that this is some "assumption". At other point we see "reality" as good models of weapons and vehicles and this point of view prevail of any other. Also, some devs use the 'reality' to deny some suggestions that they don't want to see in mod or too lazy to implement. The most important change PR from BF2 to step ahead of "reality" - disabling third person view in vehicles. Actually, there are a lot of differencies between BF and PR, but most important just restrict BF 'feature' or disabled it completely, which changes our third "column", called GAMEPLAY. The first thing that you think when start playing PR is "WHY ITS SO F%$#^K SLOW?". If hurts very hard, because sometimes you can go to the bathroom while your gun is reloading. This was also made because developers thought that fast work with weapon is "unreal". The avatar can not overcome some little edging, and must jump it over. Stamina is so small that it seems that you are driving not high-trained soldier, but some old smokers who can not even jump and run for 200 meters. Maps are suffer by lack of details, almost all buildings is not possible to enter. Usual gameplay for newbie is watching the dead screen and countdown for respawn. The countdown, moreover is increased everytime you die which should make you more durable and not dying. You can not see where is the enemy which killed you, which making you learnings harder than ever (the only way is watching the after-match replay that is drastically unusable and may not be supported by the server). At other perspective the sounds in game is very good quality, even over-worked. How we can explain that you can hear a tank in 2 km away in forest area? But developers think that this is good. The 'hearing' your opponents is cruical in the game, thats why the most top k/d players is just simple campers. Or smart campers, because game is provoking to do so - usually all pvp battles ends in first two shots. First see - first kill is the main formula of this game. The unique gamemode in the PR is Insurgency - this mode allows you to simulate a unarmed man. You will see how your schoolmates with grandpas gun die in the unequal battle against modern highly equipped army and then you also die as martyr because someone with scoped rifle not see that you have no weapon. Another not playable game mode is CnC where you can feel yourself as guest worker - you need to 'build and destroy' objectives. This game mode is so unplayable that almost all players forget about it. The balance is the other word (in addition to 'reality') which DEVs use to deny something which is not fit in their vision of the game. You might think that they are care of balancing, but this is wrong point. Many DEVs care about they 'beloved' fractions and just don't want something to be stronger or interesting against their side. So we have some 'loved' fractions at which devs pays attention, update/upgrade it, and 'unloved' - fractions with no updates at all or may downgrade their power in terms of 'balance'. Frankly speaking, since creation PR uses some other sort of balance, like asymmetrical balance. Its mean that sides not get the same powers, but wisely using their assets they are more or less identical. But meaning 'wisely' is different for all people and practically it makes that assets at one side is easy to use to get full power, and on other side another asset is imposible to use because require a lot of skill or more people or both. In ideal balance I see (and perhaps some others) that win require mastery in iteraction different assets together, but now we have some wunderwaffe at one side and underpowered fractions at others. A lot of limitations in the code was workarounded by DEVs, which is pretty amasing. At current time this is most stable and featured game for team vs team playing. Developers added several game modes - which is underestimated atm, but these modes are great. Hell, DEVs should have gold medal for supporting and developing this game in such circumstances. In some future newest games will kick PR from the scene, but currently I love it very much. In the beginning I said that I think that in current state PR should end very soon. I hope that it will not be truth and something will change, because changes is that we are loving - when things are frozen, we have no motivation to play. Last edited by fenriz9000; 2019-04-06 at 04:29.. It has to be supported by the server. Battle recorder is not really useful to find out where was the enemy who killed you. but you can use tracker to find it out - and this tool is really simple in use. Insurgency is not played that often during prime time due to the fact that teams tend to be really disbalanced when you switch from INS to AAS. CNC is not played at all because it requires two experienced commanders and a lot of experienced squad leaders - in both teams. It's not really that easy to gather that much experienced players willing to lead. There is also one quite important thing: no one wants to defend. Its about both AAS flags and friendly FOB in CNC gamemode. Usually you can find no more than 1 squad willing to defend, but after over 45 minutes of doing nothing everyone want to just leave it and attack. we have no motivation to play. PR was just a mod to make Battlefield 2 multiplayer online matches more fair, fun, balanced and focused on teamwork. Sure, it's sorta forced -- if you don't, you get the same FPS everyone is making, and people just do as they please running everywhere and anywhere they please. While some are actively watching and waiting for "PR to die" due to "failures", after almost ten years with it, I am watching in amazement that so many people are still coming to PR and staying, still making friends and still having fun for months and years on end. If this thing has been around since 2003/2004, that's a success not a failure (that it is still here and alive). If you're burned out on it, you don't need to stay to the end - for all of us, the door swings both ways - but it would be wise to accept that we are now essentially hosting a legacy game in it's Autumn years much like we'd view BF1942 esert Combat Mod Servers in 2009 when PR was some kind of huge rising star. It's still tons of fun for a lot of people, just not the same number of people concurrently as it used to. Certainly not for a lack of difficulty or complexity, but when you look at the alternatives, there just are none - nothing anywhere compares to PR as whole even if certain parts could be replicated. It is a unique gem we all should be happy we were (and are) a part of, running big servers and stomping around with friends like Jolly Green Giants walking the digital earth - with guns. You're process of balance isn't used by the dev team for the exact reason your talking about. The last powerful nation wasn't the British, it was the Germans. I'll leave names out of this, but One developer used to talk alot about how the German Devs used to buff their vehicles to be fairly broken. But that's only really half the story, in days gone by main Devs just did stuff that sounds cool, e.g. the Hind being a literal flying tank taking AP shells from all tanks constantly. AAS 128 : Where both teams have to fight over the center so have mirrored but delayed assets for a drawn out fight. -Simply people can not understand,that game play and simulate the real world do not go together.No one has managed to do it so far in the world of games,can be made but not interesting to play.Therefore there is always a compromise. -Besides that what you have ,nothing. -You only serve as cannon fodder. Then they would say it was a reality.So when the rebels won in the world against strong forces?!? !technology vs rock.The only game play in INS mode is in urban map(because you have a place to hide). -About other things not to talk as a fraction against the fraction. It just needs to be understood,brutally real and game play do not go together.Suggestions do not help,"It's fight against the windmill"-Don Quixote by Miguel de Cervantes. Last edited by lakinen; 2019-04-08 at 12:35..
That simply has never has been the case... Sure modellers do want to make stuff of factions they are particularly interested in or have a connection to (with British devs wanting to make British assets, Germans wanting to make German ones, Russian wanting to make Russian assets and so on), BUT when it comes to balancing, things are either made as realistic as possible (with regards to the engine etc) or are made to mirror other assets already ingame (which mainly goes for things like MBTs, all sharing the same basic stats with differences here and there if reality calls for it, like some tanks getting ATGMs etc). Then as FFG said, the true balance comes down to the mapper, especially for asymmetrical maps (ie, maps where both sides do not have the same exact asset types opposing each other in equal numbers etc) like in the case of Muttrah for example, which while both sides have totally different asset setups etc, is still a well balanced map (even if everyone hates playing it as it has been played sooo much). Now me being a British dev most people probably on the face of it think I've only made British assets for this mod and nothing else (with probably you also thinking that I think all British assets should be super 1337 and crush everything... ). While yes I have made a bunch of British assets over the years, if you actually go back over what I've personally made (or at least had a big part in making/helping to make), you may be surprised to find out most of what I've made has been for other factions, even those Insurgents you claim no one cares about and no one makes any assets for. 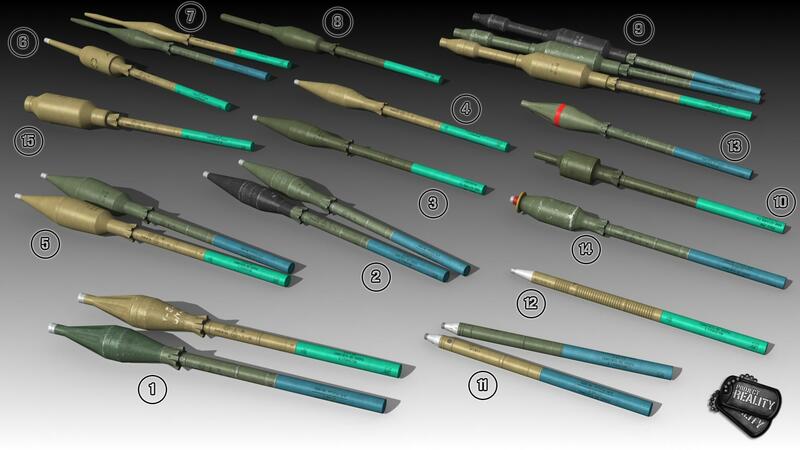 First the RPG-7 update with all the new warheads (and optimization/improvements of the launcher), again, not used by the British, mainly an Insurgent weapon but also Russian, MEC, NVA & Polish (as well as some others). Countries of Origin: Bulgaria ? I should also note that we carefully balanced these with other factions AT weapons which also share the same basic r/l penetration values etc for the most part and where they didn't, we balanced in other ways like warhead quantity etc, etc. This is also not to mention all the generic assets I've made for all the factions like all of the Deployables I've done with different deployable weapons for each, the ACVs, and many things on top. And after all of this, everything I make, be it a British asset, and Insurgent asset or whatever, I make them all with the same basic principle of being as realistic as we can make it while also being good for gameplay. Just look back through all my highlights, blogs and posts and you will find a wider verity of stuff I've done than just what I've listed above. And I'm not the exception, although some modellers only focus on making assets for one faction that is true, most modellers make assets for any faction that needs assets and then when it comes to balancing an asset, we make it true to the real world as we can, or with things like MBTs, mirror balanced with other assets (although personally on that subject I've wanted us to go down the road of making tanks as realistic as possible and then balancing things out with map balance but that is a big re-balance of the mod so we never really have). So please, enough of this crap that devs are just bais to their faction and want to make them super powerful ingame, it simply isn't true.... Thanks. But that's only really half the story, in days gone by main Devs just did stuff that sounds cool, e.g. the Hind being a literal flying tank taking AP shells from all tanks constantly. That really isn't the case either tbh. We have always as far as I can remember tried to make things relatively realistic and that thing with the Hind iirc, was more a bug with trying to make it more armoured than other choppers (since in r/l it has more amour than most choppers) and was simply a bug with the coding that took quite a bit of time to identify and fix. There's no need to justify yourself, people will always resort to bitching when they don't get what they want. Oh, Russia doesn't steamroll every map every time with thousands of tanks? Better blame the DEVs for not making Russia stronk.